I’m making progress on these but it’s slow and more difficult than I’d imagined. The instructions are not obvious until after you’ve started and made several mistakes – however, these are now resolving themselves. I’m still working one on circulars and one on DPNs, was four, is now five which I’m not fond of, but necessary to accommodate all the stitches. I’m up to just above the thumb on one and just above the cuff on the other. Here’s some pics. This is the most difficult knitting I have done for a long time, perhaps ever. It is because I am following someone else’s instructions? I don’t know but i can’t even have music on when I’m doing them and marking the chart is key to progress. This page is about the gloves that were knitted in the Yorkshire Dales. They are similar to the Sanquhar gloves and were part of the vast hand knitting industry of the Yorkshire Dales in the eighteenth and nineteenth centuries. Examples are documented by Hartley and Ingilby in their book ‘Old Hand Knitters of the Dales’, see the end of this page for a bit of history. 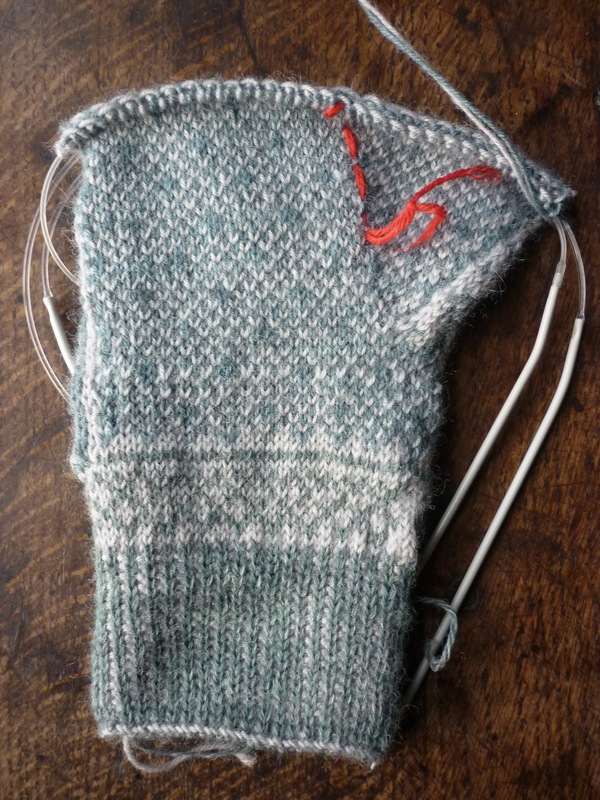 I’ve started a pair of Mary Allen gloves using two shades of 4 ply sock wool that I had in my stash, a green mix and pale grey. I’m putting my partner’s initials on the cuff of the left hand one and the date, 2011 on the right cuff. I’ve knitted the left one as far as the rib and initials on two circular needles, 2.75 but have started the second on a set of four as I don’t have any more circulars the right size. I’ve started a sampler for these using the pattern written by Sue Leighton White that’s been reprinted in Knitting Traditions 2011. 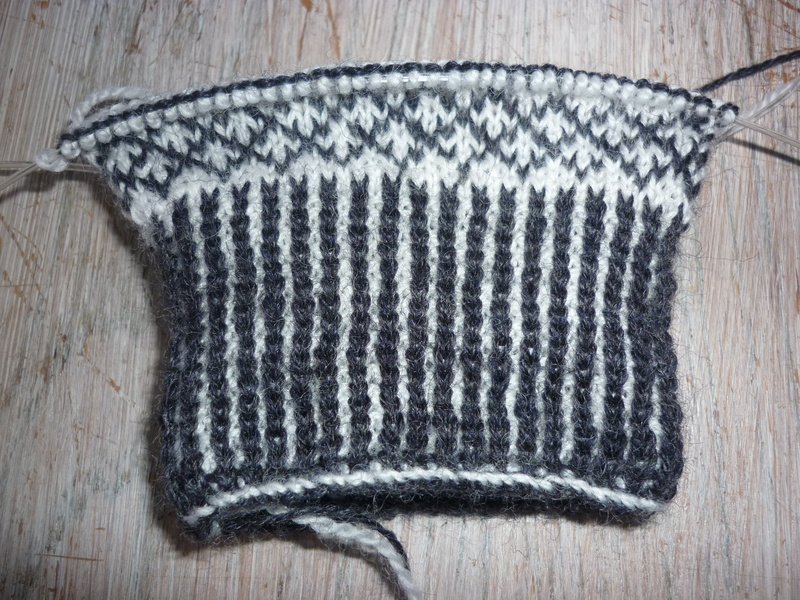 To try out the rib I used the 3 ply wool I’d used for the Sanquhar glove in charcoal and white. The twisted cast on gave me a challenge, I had to try it a couple of times before the penny dropped but here it is. On Friday 28th October I went to see the Dales gloves in the Dales Countryside Museum in Hawes, Wensleydale, North Yorkshire. 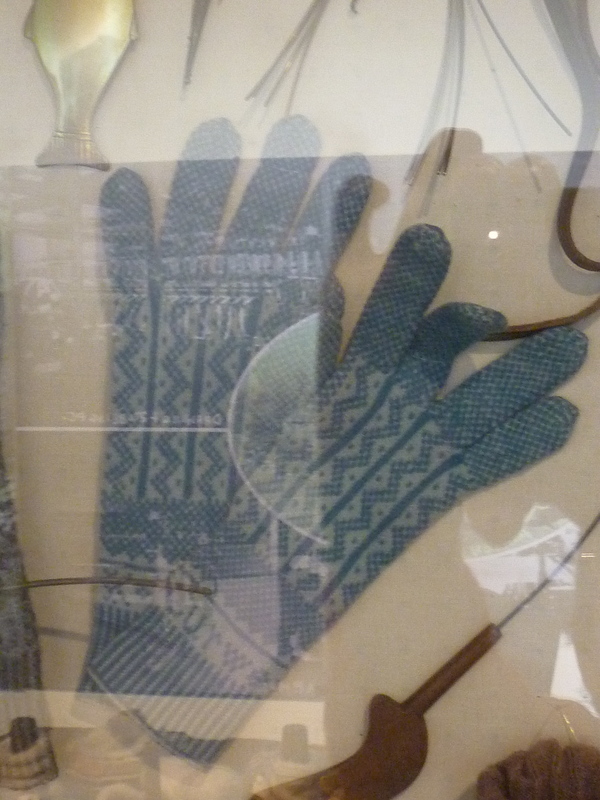 There are several pairs of gloves on permanent display and several Dales gloves in the collection which the curator, Debbie Allen had got out for me to see. 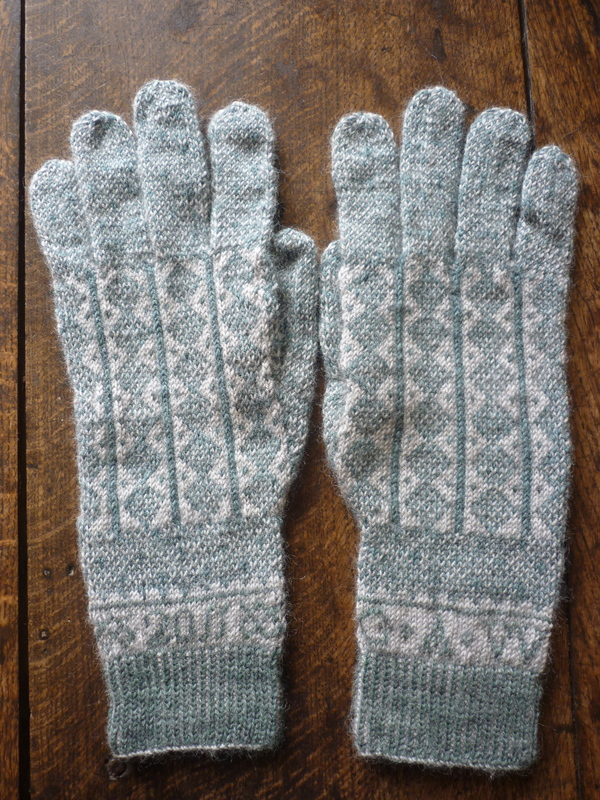 This page is about the gloves that were knitted in the Yorkshire Dales. They are similar to the Sanquhar gloves and were part of the vast hand knitting industry of the Yorkshire Dales in the eighteenth and nineteenth centuries. 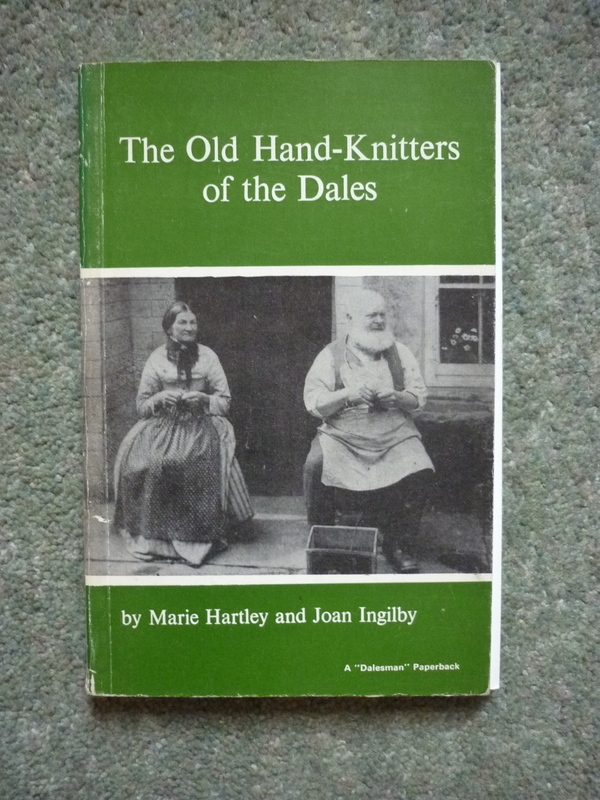 Examples are documented by Hartley and Ingilby in their book ‘Old Hand Knitters of the Dales’. 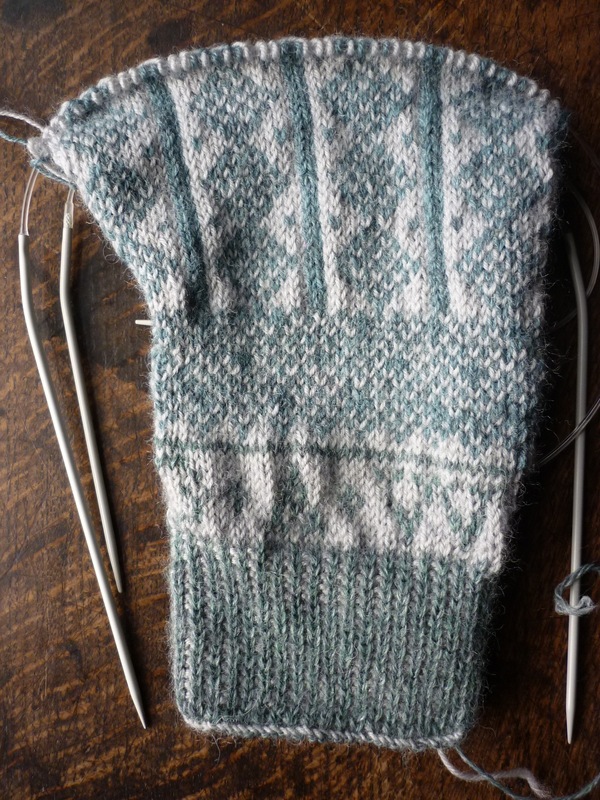 I’ve started a pair of Mary Allen gloves using two shades of 4 ply sock wool that I had in my stash, a green mix and pale grey. I’m putting Gordon’s initials on the cuff of the left hand one and the date, 2011 on the right cuff. I’ve knitted the left one as far as the rib and initials on two circular needles, 2.75 but have started the second on a set of four as I don’t have any more circulars the right size. to read your blogs. Now that I have discovered Mary Allen I would love to learn more about her history. Are there any of her patterns available to knit? What a lovely discovery for me to make so late last night. I just wish this art was more easily obtainable, there is so much I still want to learn. Thank you, I expect I will be visiting your website frequently in the future. How lovely to hear about your glove knitting. The Mary Allen pattern is available from the Wordsworth Trust in Grasmere as a charted pattern leaflet. Sometimes there’s a bit of history too about her. It’s also reprinted in the American magazine, Piecework, and again in Knitting Traditions, but I’m catching a train in less than an hour so can’t look these up just now. But let me know if you can’t find them. I must blog more regularly – it’s a bit like buses, none for ages then three come along all at once. I am going to see the ecclesiastical gloves in the V and A today – so very excited about that. Sorry about extra bits of writing at the end, mobile phones have hiding places for lost bits of dialogue! Those gloves are amazing. I have collected a number of photographs of these incredible works of art. I have visited the V & A museum many times. I’m sure you will have a wonderful day. Yes it was great. I spent 2 hours with 3 pairs of gloves that I was not allowed to touch and did lots of drawings and took lots of pictures. Will blog about it soon, just too busy knitting at the moment.